A big problem with Pages, as opposed to groups or personal profiles, has been that when an organization wants to send information to its “fans” it must send an “Update” as opposed to a message that goes in the regular Facebook Inbox. But most users rarely check their updates; at least not anywhere near as regularly as they view their Inboxes. This has significantly reduced the usefulness of Pages. 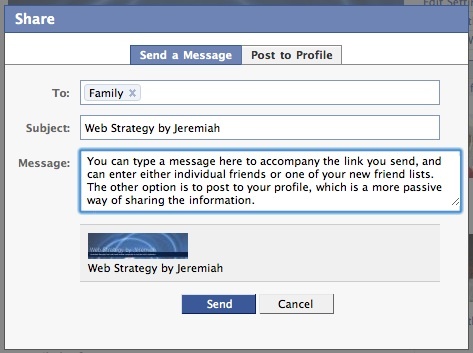 Update and share: Like a user profile, your Page can now update its Fans with statuses—short text-only messages. Soon, these statuses will appear in Fans’ News Feeds. Tabbed Structure: The tabbed structure multiplies your possibilities. Similar to their functionality in user Profiles, tabs help keep Pages organized so people know where to go to get different pieces of information. The Wall tab is for dynamic content, the Info tab has static information, the Photos tab contains photos albums and Fan photos, etc. Wall: The Wall tab closely resembles the Wall tab on a user profile. You and your Fans can use the turnkey publisher tool in the main column to share comments and even rich media. Posts by your Page go to your Fans’ News Feeds, and comments by your Fans go to their friends’ News Feeds. Those posts will hyperlink back to your Page. Facebook has a Step by Step Guide to the new pages that is helpful, and the Best Practices documents for each particular kind of page (Public Figures, Music & Bands and Communities) also provide good guidance. Check out our Mayo Clinic fan page, which we have adapted and republished with the new format. Another major improvement is the ability to use the Notes application to import blog posts into your organization’s Facebook public profile. So, for example, we are importing our Sharing Mayo Clinic blog posts into our Mayo Clinic page, which will help create more readership and engagement. Updates to fans are still available, and can be targeted to certain demographic groups among your fans. So, in the case of Mayo Clinic if we have a notice that only affects one of our three campuses, we could limit the distribution of the update to residents of a certain state. I understand if some organizations have spent significant time customizing the look of their Pages, that they would not immediately appreciate the changed look. That explains some of the early angst among commenters on the Facebook announcement. But overall it’s a really good thing for organizations to have functionality that feels similar to personal profiles. And the inclusion of status updates within the news feeds of fans is valuable enough all by itself to make the new Facebook pages a much better value for organizations. Especially since everything you see on the Mayo Clinic page, for instance, is free! If public profile updates will “soon” be published to the news feed, I’m hoping “soon” means tomorrow or next week. Anyone have any insight on how soon “soon” is? Can you be a celebrity without having any fans? In Facebook, I guess you can. 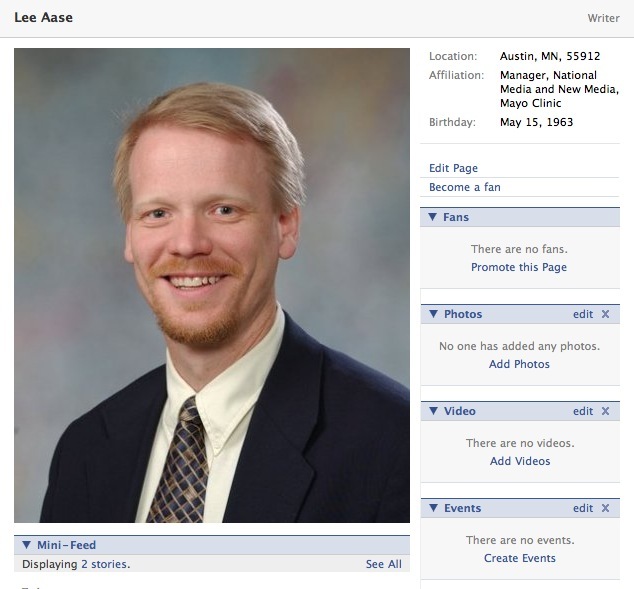 I had originally tried a workaround for the personal/professional Facebook separation by creating a group called Lee Aase’s Professional Contacts. Establishing a brand page for your professional persona looks like it might be a better way. People can become “fans” without being “friends.” You don’t have to approve it. You can put your email address on your Celebrity page. So if you want to put forth a professional representation of yourself, you can. You can upload videos and photos. You can post links to some of your most significant news coverage or blog posts. And you don’t have to worry about the various applications you’ve installed on your personal profile cluttering your celebrity page. Seeing that Scoble and Jeremiah have fan/brand pages in the Critic and Writer categories, I decided to give it a shot. I looked at the Facebook Terms of Service and didn’t see any requirement for a certain level of notoriety before someone could be a celebrity. So if two of my Facebook friends, Jeremiah and Scoble, can have both user accounts and celebrity pages, hopefully I won’t run afoul of the TOS with my celebrity page.